crankandpiston pits the new Porsche 911 Turbo S against the McLaren 12C Spider to see if Porsche really has built a supercar-bating sports car and what the McLaren has got left up its sleeves as it nears the end of production. Much has been made this year concerning the demise of the McLaren MP4-12C. 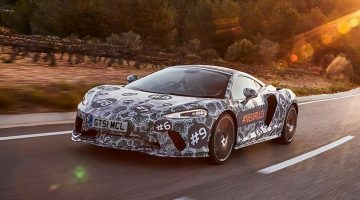 Though adamant that its new 650S was not a replacement (given that the increased performance figures and engine output slot the newboy snuggly above McLaren’s first-ever sports car), it wasn’t long before the jig was up, and the 12C came to an end less than two months later. 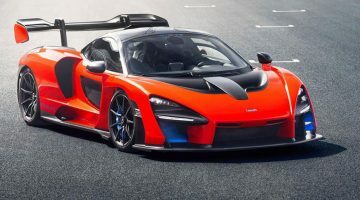 With production numbers well on the way to the originally stated 4000 units and Woking’s new P13 ‘mini supercar’ just around the corner, McLaren’s decision was an understandable one. As a proven Ferrari 458 Italia and Lamborghini Aventador beater after all, what more did the 12C have to prove? Talk has also been strong recently concerning Porsche’s new generation 911 Turbo, the latest in a lineage dating back to 1973. No surprise then that the boys and girls in Stuttgart have gone all out for the Turbo’s 40th birthday, life beginning anew in the 991 variant with a sizeable power hike, a new chassis, handling-friendly technical upgrades, and a new sub 7.30m Nürburgring time. From its humble beginnings as an occasional 1980s yuppy hospitaliser, the Porsche 911 Turbo has legitimately established itself as not just a very proficient sports car but one capable of equalling the best supercars available today. Such considerations naturally got us thinking at crankandpiston.com. 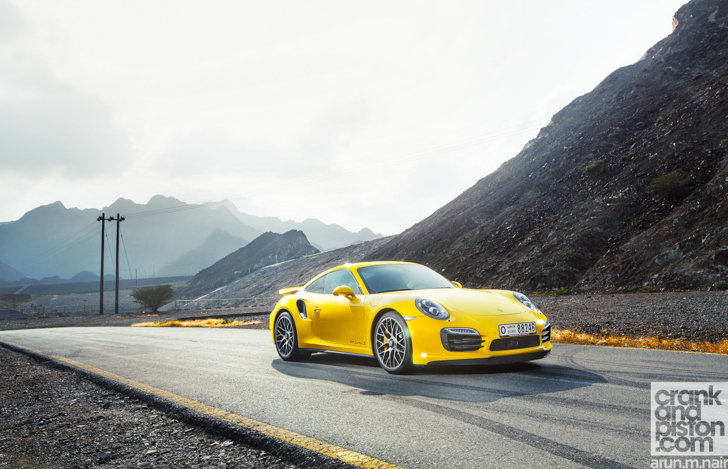 Could the new Porsche 991 Turbo S – honed with years of 911 precision and equipped with new earth-spanking grunt – prove the match of any supercar we threw its way? And could the McLaren 12C – heading the way of the scrapheap – prove after four years in production that it was still top of the class? Time to find out. It’s a crisp (read sweltering) 10am on Dubai’s perimeter Emirates Road, and our Porsche-McLaren-long term Volkswagen Tiguan convoy is making its way towards the winding tarmac through the Fujairah mountains and its Wadi Wurayah National Park crowning treasure. Joining me today are crankandpiston photographer Arun – who’s been itching to get his hands on a Porsche since his ‘splash photography’ shoot – crankandpiston videographer Jose, and former Nissan GT Academy contender (and crankandpiston Journals contributor) Steve Smuts, who’s taken up position in the 12C Spider whilst I take point with Arun in the Porsche. Yes, you read that correctly. A little miscommunication pre-photoshoot means that the tin top test model from Porsche will be fighting for honours today against McLaren’s convertible Spider. Given though that the MP4-12C was originally designed as a convertible, that the retractable hardtop roof has (somehow) added no weight, and that the Spider’s performance figures are exactly the same as the coupe’s, we weren’t about to put in a complaint to McLaren ME GHQ. Indeed, so popular has the 12C proven that the regular test model has also been sold, and we were very fortunate the team at McLaren Dubai was able to source us this showroom model at the eleventh hour. Almost two hours of highway driving with the McLaren in the Porsche’s rear mirrors allows me time to enjoy its subtle design, though the number of iPhone pictures being snapped of the Turbo S by passing motorists suggests that even in the presence of a $287,000 McLaren, the $194,800 Porsche is no underdog. During my hour or so in the Porsche bucket seat, I’ve tried hard not to be swayed by the Racing Yellow paint, but it’s hard. 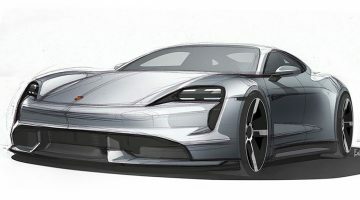 It’s very ‘Porsche’, offering the correct blend of WTF and sportiness, a balance that would be lost with lime greens or metallic purples. And in much the same way the subtleties of the McLaren are emphasised by the understated silver, the yellow really brings out the strong curves of the Turbo. The smooth flanks and no-nonsense bonnet lines are offset by those enormous rear wheels arches (deliberately wider than on a standard 911), heavily air-intaked front bumper and nifty traditional oval headlights. It’s a look that’s both no-nonsense and simultaneously flamboyant, sentiments arguably demonstrated no better than via the 20-inch wheels and rear wing. Diehard Porsche fans may yearn for the days of a smaller, thinner 911, but there’s no denying the new generation is a stunner. It’s a shame that the Racing Yellow on the outside has been taken to new extremes on the inside, the matching centre console trim, seatbelts and upholstery being a bit over the top. Similarly, Porsche’s traditional button-fest console means the cabin is still not as user friendly as it could be: my attempts to set the satnav before leaving Dubai just produce a slick forehead and a lot of swearing. It’s all a far cry from McLaren’s typically ‘less is more’ setup in the Spider, where two buttons, an infotainment touch screen and two bucket seats are about your lot. You’re unlikely to get lost navigating through the climate control settings (one rotary dial on each door panel), the 12C’s simplistic cabin instead encouraging you to just get on and drive. And given the enthusiasm with which Steve begins harrying my rear bumper as we enter Fujairah, it’s a message that’s clearly working. 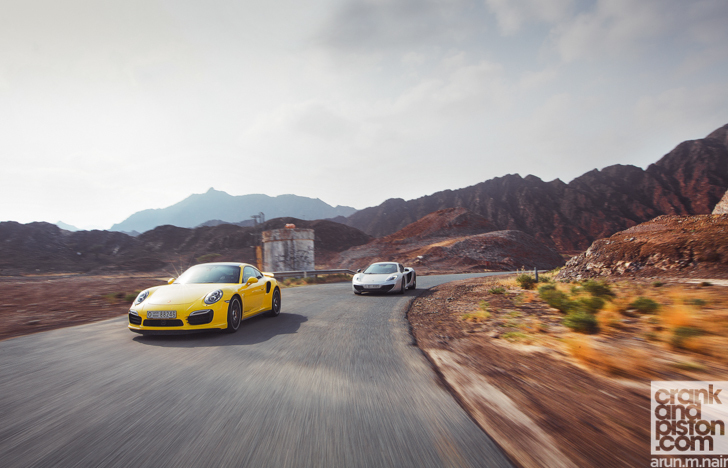 The shrill whine of Porsche’s six-cylinder and the bassy notes of McLaren’s twin-turbocharged V8 are soon echoing across the valley as we wind our way towards Wadi Wurayah National Park.